UPDATED: Fri., May 11, 2018, 10:19 p.m.
On Friday, a Spokane County District Court judge granted Maclay’s request to change his legal name. The 60-year-old man is now DumpOzzie Dot Com – a nod to his website, DumpOzzie.com, where he publishes conspiracy theories about Knezovich and the sheriff’s office. Maclay, who has no law enforcement training but claims he once turned down a job offer from the CIA, said he intends to run against Knezovich in this year’s election. He hasn’t filed, but said he plans to formally announce his candidacy sometime next week. “I’m running because I think the sheriff is not accountable, open or transparent,” he said. Maclay has been a boisterous presence at Spokane Valley City Council meetings and other events, once falsely claiming he was a bodyguard for state Rep. Matt Shea. 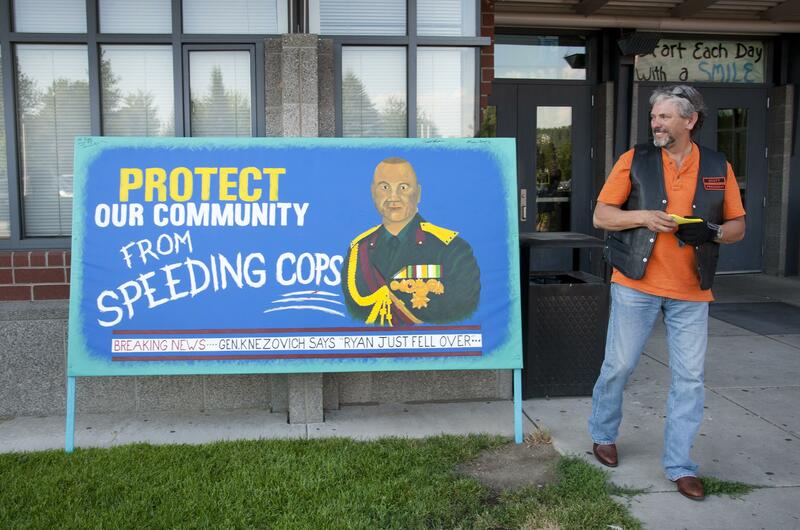 And he has been a thorn in Knezovich’s side for several years, railing against the sheriff’s handling of high-profile incidents such as the death of Spokane Valley pastor W. Scott Creach, who was shot by a deputy in 2010, and the death of 15-year-old Ryan Holyk, who was struck by a deputy’s patrol vehicle while riding his bicycle in 2014. Knezovich said Friday that he and his deputies responded to the service at the request of Strahan’s family because Maclay “went there with the intent of disrupting that funeral for his own political gain.” He said Maclay then tried to goad deputies into a fight in the gymnasium at University High School, where the memorial was held. Although the charges from that arrest were ultimately dismissed, Knezovich said Maclay is dishonest and has a violent past, and he pointed to a protection order recently filed against Maclay by Maclay’s ex-wife. Knezovich said he isn’t surprised that Maclay channeled so much energy at him. Published: May 11, 2018, 7:15 p.m. Updated: May 11, 2018, 10:19 p.m.